Many people mistakenly believe that if couples live together for long enough, or after having children, they become ‘common law spouses’ and automatically develop legal responsibility to support each other financially. This is a widespread misconception. If they split up, the courts cannot divide finances or property between the two, just because it might be fair. Parents do have financial obligations towards any children they may have, but there are no equivalent responsibilities for a partner. Partners are not entitled to financial support even if one partner – often the mother – has given up or reduced work to raise children. This means that person could be left with no financial security, without a home and with no access to pensions or savings. themselves in a precarious situation. We’re campaigning to reform the law, but, in the meantime, it’s important to raise awareness so cohabiting families are able to protect themselves. 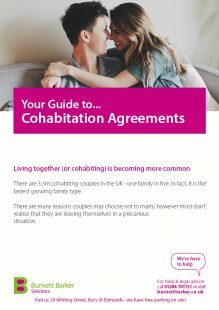 • A cohabitation agreement will set out both partners’ intentions around property, finances and how they would support their children if they separate. • If acquiring property jointly, ensure both names are on the deeds to the house, and enter into a declaration of trust if parties intend to own in unequal shares. You may also wish to take a look at our recent article on the importance of Cohabitation Agreements. If you’d like one of our specialist family lawyers to write your Cohabitation Agreement,our fixed fee starts from £750 + VAT. Call us today on 01284 701131 or email us here.